You are here: Home > Is dementia research keeping pace? For too long, dementia research has been playing catch-up. The devastating impact of the condition is well-documented: more than 850,000 people are now living with dementia across the UK and for those affected, it is life-shattering. Research is the only way to change this, and that’s why we’re delighted to publish new figures today that reveal a significant milestone for dementia research, one that could not have been achieved without your support. Our report, Keeping Pace: progress in dementia research capacity, shows that the number of dementia researchers has almost doubled in six years – rising to an estimated 6,141 scientists in 2014/15. Over the same period, we’ve seen research productivity soar too: the number of scientific papers published revealing new discoveries each year has also nearly doubled. The figures are proof that we’re gaining ground in the search for new treatments and preventions for this devastating condition. This hasn’t come about by accident. In 2012, we laid out a challenge to government after our research highlighted a shocking disparity: for every six cancer researchers in the UK, there was just one dementia scientist. It was clear that we couldn’t make the progress needed without a significant cash injection. So we raised our voices to call for more investment, and we were joined by people across the country who helped us get the message heard. In recent years, the government has answered that call with welcome funding increases – and today we can show that funding works. This new investment has attracted more scientists to work on dementia so that today, it’s no longer one dementia researcher to six cancer researchers, but four. And those scientists are working tirelessly. We now know more than ever before about the diseases that cause dementia, and we’re working to translate that knowledge into new treatments. But the report also reveals that despite these strides forward, dementia research still lags far behind other serious conditions. Compared to research into other disease areas, dementia has only just left the starting blocks. 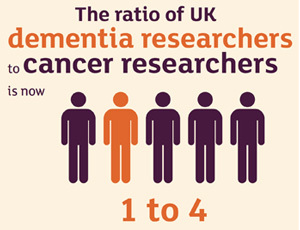 It’s a sobering statistic that the total number of UK dementia scientists today is still less than the number of new researchers gained by the cancer field over the last six years. So although we must celebrate the progress being made, we need to transform our level of ambition if we are to change the outlook for people with dementia. Of the country’s top five leading causes of death, dementia is the only condition for which numbers are still rising. It’s over 100 years since Dr Alois Alzheimer saw his first patient, a lady called Auguste with memory problems, personality changes and hallucinations that now define Alzheimer’s disease, the most common cause of dementia. This century has seen mankind achieve incredible things – creating a digital age and putting a man on the moon. But if Auguste were to visit a doctor today, there’s still nothing to offer her that could slow or stop her disease. This is simply not good enough. We may not have dementia survivors yet, but long-term research investment can change that – as it has for other conditions that were once considered a death sentence. We are proud to be involved with a host of innovative research initiatives that hold potential to create a real step-change in dementia research. But this should only be the start. Our report demonstrates the influence that funding has, which is why with your support, we are determined to drive even more investment into research. But we need to see that determination matched with ever more ambitious investment from government and industry to tackle this crisis head on. What happens next will have a lasting impact for the future: we owe it to all those affected by dementia to increase our pace. To see the figures from the report and many more dementia statistics, visit our new Dementia Statistics Hub. To help us in our call for increased research funding, sign up to become a campaigner. One Response to Is dementia research keeping pace? 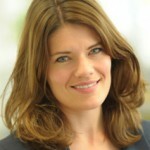 Thank you, Hilary, for posting this great blog here. This is very informative and highlighted on such important researchers of dementia. Keep posting such more.